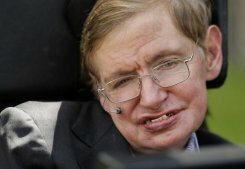 No doubt Stephen Hawkins is a brilliant man who is a great example of someone who has over come adversity to become one of the foremost minds in science. His only fault is not recognizing that it wasn't all under his own power, but the many individuals who help him through his daily needs with their acts of hope, love and charity. These gifts given to them, written on their souls by our divine Father in heaven. The mind he uses to explore the wonders of the universe also a gift from our Heavenly Father. Meanwhile, I'll continue to pray for him and thank our Father for the many gifts he has given Stephen as well as myself.